DALLAS (Dec. 12, 2017) – The three finalists for the inaugural Jason Witten Collegiate Man of the Year were announced today. In line for college football’s newest award, which recognizes exemplary leadership both on and off the field, are Alabama’s Minkah Fitzpatrick, UCF’s Shaquem Griffin and Oklahoma State’s Mason Rudolph. Selected from a group of 20 semifinalists by a subset of the Jason Witten Collegiate Man of the Year Board of Directors, the three finalists have all demonstrated an outstanding record of leadership by exhibiting exceptional courage, integrity and sportsmanship. All three will be invited to the award ceremony on February 22, 2018, at The Star in Frisco, Texas, where the winner will be announced. Minkah Fitzpatrick (Jr., DB, Alabama) is the leader of fourth-ranked Alabama’s feared defense and is unquestionably one of the best overall players in the country. But his dedication to academics, which earned him a spot on the SEC’s Academic Honor Roll last year, and focus on community work, where he has done mission trips and been a leader in Fellowship of Christian Athletes, has made him a standout off the field as well. Shaquem Griffin (Sr., LB, UCF) has become one of the nation’s top defensive players and led his team to an undefeated season and a conference title, despite having only one hand. He has been an inspiration to his teammates and has already graduated with a degree in sociology. A regular volunteer at local Boys & Girls Clubs, Griffin is the reigning American Athletic Conference Defensive Player of the Year. Mason Rudolph (Sr., QB, Oklahoma State) is one of the college football’s premier quarterbacks and the unquestioned leader of the 19th-ranked Cowboys. Rudolph has been a strong presence in the Stillwater community, where he has worked with countless children’s programs and developed friendships with local children who are seriously ill. He has routinely posted some of the best passing marks in all of college football while becoming a standout in the classroom. The inaugural Jason Witten Collegiate Man of the Year, presented by Albertsons and Tom Thumb, will be the first college football honor to focus primarily on a player’s leadership, both on and off the field. Leadership is a term synonymous with Jason Witten, who, in addition to becoming one of the best tight ends in the history of the sport and the Cowboys’ all-time leading receiver, has served as one of football’s most prominent role models during his 15-year pro career. In addition to winning the Walter Payton NFL Man of the Year Award in 2012, Witten has also received the Bart Starr Award, Pro Football Weekly’s Humanitarian of the Year Award, Home Depot NFL Neighborhood MVP and the Bob Lilly Award, among many others. All of those honors have recognized his work in the community, achievements on the field and dedication to his teammates and family. 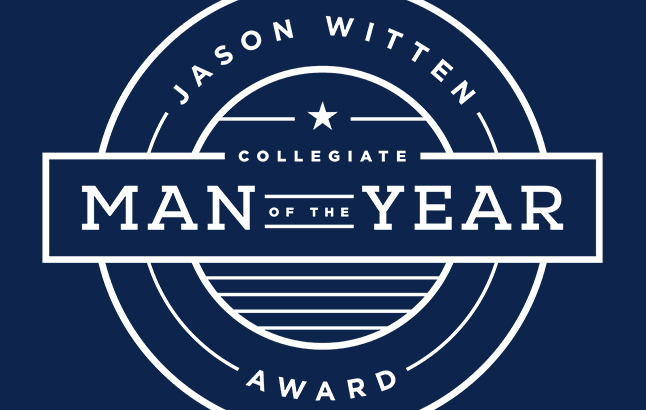 The winner of the Jason Witten Collegiate Man of the Year will also receive a $10,000 contribution in his name to his school’s athletic scholarship fund. The contribution will be made by Jason Witten’s SCORE Foundation, the official charity of Jason and his wife Michelle. The SCORE Foundation, founded in 2007, has positively impacted tens of thousands of children and families in Texas and Tennessee over the last 10 years. The foundation operates its nationally-recognized SCOREkeepers program, which places trained male mentors on staff to work with children at family violence shelters, at nine shelters in the two states. SCORE has also operated a weekend food backpack program for disadvantaged children in North Texas, opened Jason Witten Learning Centers in five different Boys & Girls Clubs and opened the Jason and Michelle Witten Emergency Waiting Room at the Niswonger Children’s Hospital in Johnson City, Tenn.